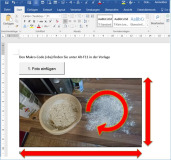 The following word example in a Word template shows how to automatically select a photo and paste it into the Word document. In the photo in size will be adapted and automatically rotates. Const const_sting_Path_Photos_Default = "C:\_Daten\Desktop\#ANDRO\100ANDRO 2016-10-06\2016-10-09 Ciabatta Brot" 'C:\_Daten\Desktop\Uni\Fotos"
objFiledialog.Title = "Select the photos.."